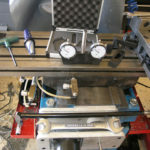 Machinists use various kinds of indicator (the dial test, or lever style and the dial indicator or “plunger” style) all day long for various purposes such as tramming a vise. If you’re serious about measuring something with one, you need to be aware of cosine error. Cosine Error is determined by the angle of the indicator tip to the surface being swept. 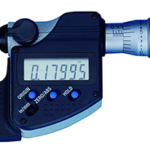 What that means is that with the tip at a 60 degree angle, when the indicator reads 0.010″, the real distance is 0.005″. That’s quite a bit of difference! We’ve talked about dial test indicators (lever type) so far. The angle is the angle of the tip arm to the flat surface being swept, or the angle to a tangent to a curved surface being swept. Cosine angle also affects dial indicators (plunger type). The difference is in how we measure the angle. 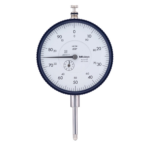 With a dial indicator, you want the plunger to be perpendicular to the surface being measured. So, the angle for cosine error calculations will be the difference between that ideal perpendicular angle and the real angle the indicator is at. Unless you’re really messing with some fidgety measurements, you probably won’t make many calculations to adjust for cosine error. But what you should do is be aware of what it is and try to always arrange to use your indicator so that cosine error is minimized. It’s a basic technique thing. I saw in an article in MMSOnline that there are indicator tips that are shaped like an involute. Involutes are interesting curves that are also used for gear design. The thing to note is that up to a cosine error angle of as much as 20 degrees, the shape of the involute tip makes it self-correcting for cosine error. The tip is said to be football shaped. I’m curious whether indicators with such tips are available “off the shelf”. Mitutoyo says they’re a custom item in their dial indicator pamphlet. BTW, very cool little 3 page pamphlet with a cutway of a dial indicator. Another thing is that some indicators are calibrated to work with zero error at an angle other than zero. My favorite dial test indicators are Interapids, and they are calibrated to be spot on at 12 degrees according to Long Island Indicator. What a great idea as it seems like the arm is always at an angle using a DTI. You can see why from my illustration, things start getting in the way if you truly have to sweep at zero degrees. If you haven’t used an Interapid, you’re missing out. Yup, Interapid 312B-15, .0005″ w/1 1/2″ dia. face, the best. First ones I bought were around ~$100. Not sure what that tells me!!! 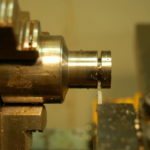 If a machinist is making a pickup with an indicator mounted in the spindle he is using the indicator to make a comparative measurement in almost every case. Cosine error does not matter when making comparative measurements. If, for example, a machinist is picking up the center of a round feature by setting the indicator along the “X” axis, and then swinging the indicator 180 degrees, he will then move the axis to achieve a reading of one half of the total indicator reading. 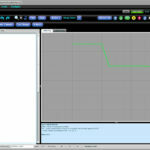 After this adjustment, the indicator should read a perfect zero when swung side to side along the “X” axis. If the indicator is reading ,0012 for every true .001 it doesn’t matter. As a matter of fact, the action is slightly more sensitive.